The MiniHome is a tour de force of ergonomic design and space-saving ingenuity, if one can get past the stereotypical 70s Harvest Gold & Avocado Green interior color scheme – the decor is up to the buyer, at least. At 125 inches long, 79 inches wide and 73.25 inches high, the camper offers copious living space that includes a full-size bed in the cabover section. Other VW RV amenities include a slide-out butane stove and stainless steel sink (above), a 50-lb icebox and a closet. Web Urbanist has a large gallery of pictures and links to technical information about these unusual RVs. Nothing like a motorhome that sounds like a sewing machine. How is this not called a Winnebugo? One thing about camping... so many Bugs. 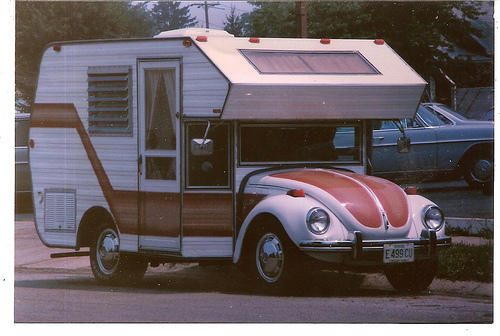 "The Bugaroo -- The VW Beetle-Based Motorhome"